The establishment of British power in India was a long process and was possible mainly because of two factors – one is the industrial revolution which gave the British rulers a superior technology. The second factor was the Indian failure to present a united front. The British exploited this weakness to eventually, after over a hundred years, to consolidate their power in India. To unite the people, Satguru Ram Singh Ji started the Kuka Movement. The date of 12th April 1872 is usually known as the official day when the movement was born, though in real essence the foundations of the movement were being laid down by Satguru Ram Singh Ji a few years before. The open permission for slaughter of cows in the Punjab given to the Muslims by the British was resented bitterly by all sections of the non-Muslim population. The British and Muslims deliberately hurt the sentiments of their Hindu and Sikh neighbors. Desecration of The Golden Temple and other Gurudwaras had already led to the sacrifice of Namdhari Sikhs in 1871– hanged without trial in Amristar, Ludhiana & Raikot. These instances ignited new realizations in the people of the Punjab ie freedom was not going to come cheaply. The British were alarmed and saw the Kuka movement as a pillar which could end their rule. In Malerkota, an incident of a minor nature occurred in which Gurmukh Singh Namdhari requested a vegetable seller to show mercy on an Ox which was suffering at its owners orders. The ensuing verbal confrontation between the two led Gurmukh Singh to the court for punishment. A Muslim judge, instead of pacifying the excited feelings, ordered that the Ox be slaughtered before the eyes of Gurmukh Singh. The next day Gurmukh Singh went to Sri Bhaini Sahib and narrated the whole story. Revenge was high on the mind of the Sikhs and Satguru Ram Singh Ji said "If you can hold your emotions for a year more, I will achieve, without the help of weapons, the object for which you are drawing out your swords. I cannot however go against the orders of Guru Tegh Bahadur Ji”. The Sikhs could not control themselves and on 13th Jan 1872, about 150 Namdhari Sikhs under the leadership of Sant Hira Singh and Lehna Singh proceeded to Kotla to avenge the wrong done by a fanatic Muslim judge. Fighting took place between the Sikhs and Malerkotla officials and many lives were lost. The Namdhari Sikhs voluntarily surrendered themselves to the authorities. Meanwhile The Deputy Commissioner of Ludhiana, The infamous Mr Cowan rushed to the scene and took over charge from the minor ruler of Malerkotla. Cowan ordered that the Namdhari Sikhs be brought before him and ordered that they be blown to bits. On 17th January, 49 Namdhari Sikhs were blown away with cannon guns. Next day on 18th January a further 16 Namdhari Sikhs were blown to their deaths. On the death role was 12 yrs old Master Bishan Singh. Cowen’s wife begged him to show mercy on the little child. Cowen agreed but on a condition that Bishen Singh had to denounce that he was a sikh of SRS. On hearing this Bishen Singh grabbed hold of Cowen’s beard and did not let go till he was chopped to bits. Bishen Singh was the 50th shaheed on 17th January. Today a 66ft tall memorial khanda stands in the grounds where the shaheedes took place. The khanda is bulleted with 66 holes, some large and others small. The large holes denote adults and the smaller ones represent the minors who were barbarically slaughtered in 1872. Sir Henry Cotton in his book, Indian and Home memories on page 112 says "For my part I can recall nothing during my service in India, more revolting and shocking than these executions and there were many who thought as I did and still think that the final orders of the establishments were lamentably inadequate”. The British seized this opportunity to arrest Satguru Ram Singh and many of his subas. They were put under arrest on the night of 17th January and next day taken to Allahabad. No trial against Satguru Ji took place. Satguru Ram Singh Ji was exiled to Rangoon in March 1872. When Satguru Ram Singh Ji got the news of his arrest He remarked "the time I anticipated has come”. Satguru Ji covered his body with the same black blanket and also covered his head with a black cloth and said "today get ready a bullock-cart for me”. The memorial pillar symbolises the life of the 66 kuka martyrs who were blown off with cannons , without a trial and many without even their names recorded. 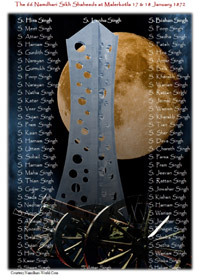 The memorial KHANDA has 22 holes on each side representing the 66 cannon balls fired, as the martyrs sacrificed their lives for the cause of the Namdhari Sikhs fight for freedom and against cow slaughter.